China’s latest lunar year started on 5 February and investors will be delighted to welcome the Year of the Pig and say goodbye to the Year of the Dog. 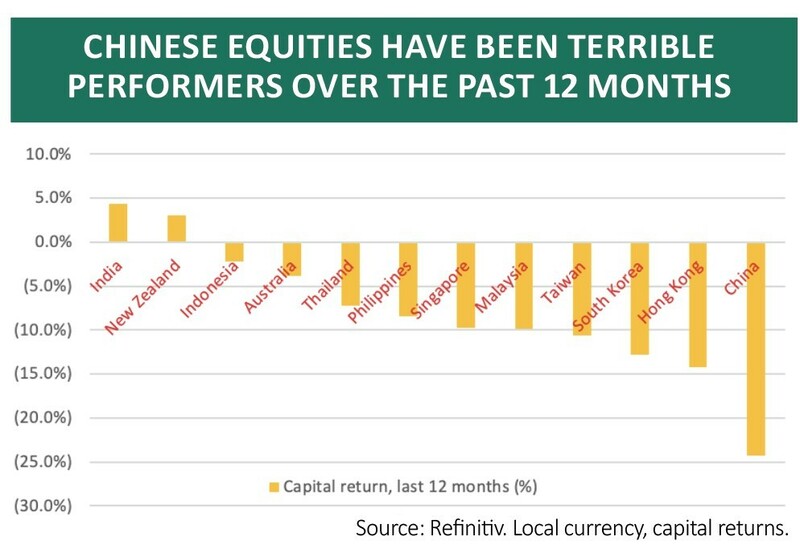 China ranks dead last in capital, local-currency returns from Asian markets over the past 12 months so its stock market has, frankly, been a dog. Economic growth does not guarantee positive stock market performance, at least in the short term. Chinese GDP grew by 6.4% year-on-year in the fourth quarter of 2018, a number that any nation in the West would kill for, but this was still disappointing. It represented the slowest growth rate for a decade and doubts lingered over the quality of the growth, too, given its apparent reliance on government stimulus and debt. Fund flows are never enough on their own to take a market higher. In 2018, index constructors such as MSCI and FTSE Russell began to include onshore Chinese A-class shares, and not just Hong Kong-traded H shares, in their benchmarks. This prompted much chatter about a wall of money piling into Chinese stocks, not least because passive trackers, such as exchange-traded funds (ETFs), could have to buy to reflect the new, increased weighting given to China. 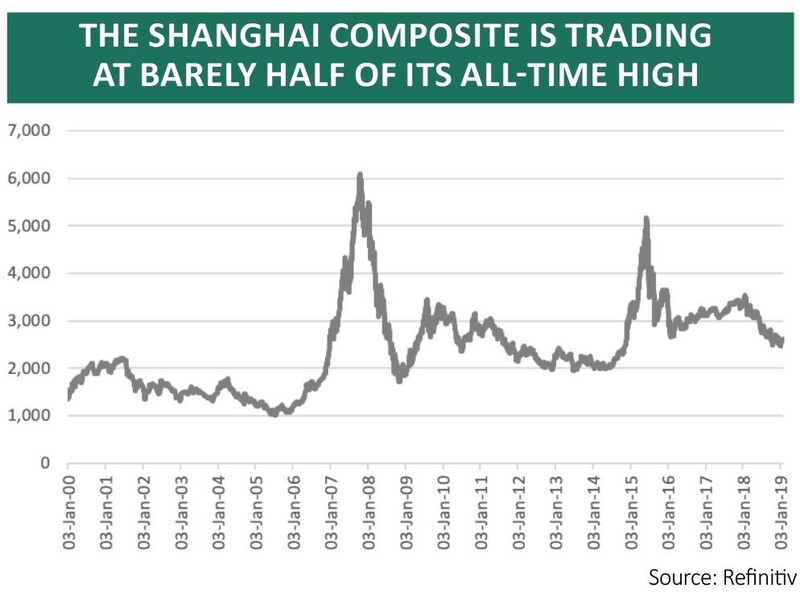 The money may have flowed but it did not help the performance of Chinese stocks as technical buyers were clearly accommodated by plenty of willing sellers. You can have good news and cheap stocks, just not both at the same time. Buying Chinese or China-related stocks when the country’s economy was booming could have led investors astray, as they would have been buying when those valuations and expectations were highest, downside protection was at its thinnest and the asset class at its most dangerous. 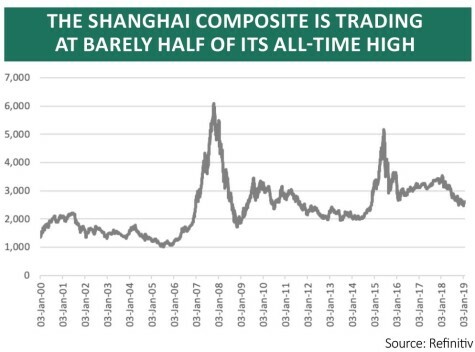 By contrast there seems to be precious little good news around, at least if the Shanghai Composite index is any guide. The benchmark is no higher now than it was in January 2007 – and that may be good news. Depending upon whose estimates and which index you use, analysts’ forecasts put Chinese stocks on around 10.5 times forward earnings for 2019, down from 14 to 15-times a year ago. Such a steep de-rating points to a major loss of faith in Chinese stocks. It also suggests that it may not take too much to go right to persuade money to return, since expectations are now lower and thus easier to beat. Oil. China is a net buyer of crude so oil’s rise to $80 a barrel in early 2018 increased costs for corporations and squeezed profit margins. But oil has since settled back to $60 which is potentially helpful. the buck rises, emerging markets seem to struggle and vice-versa, not least because so much emerging market debt is dollar-denominated. A strong US currency makes it more expensive to service this borrowing, sucking cash out of emerging market economies and hampering growth. 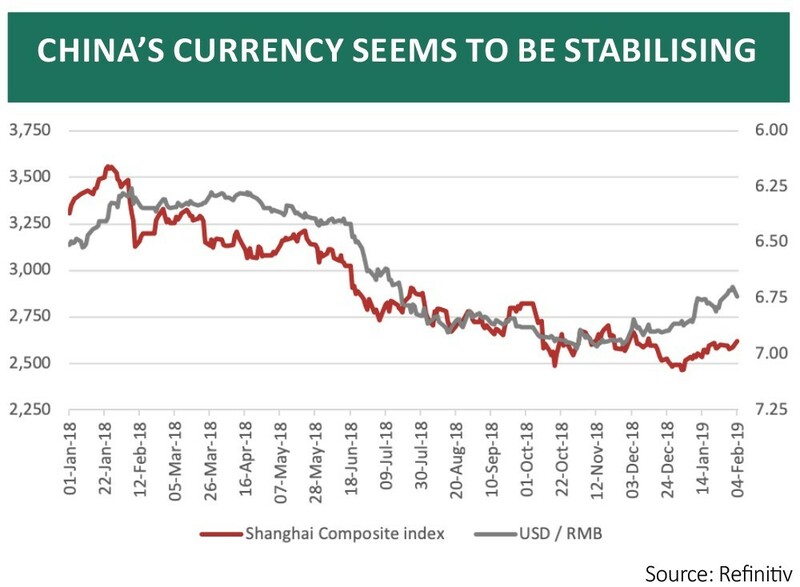 The dollar was strong in 2018 and China’s renminbi was weak. But the US Federal Reserve’s possible U-turn on further interest rate increases in 2019 and hints it could slow or stop its programme to shrink its balance sheet and withdraw quantitative easing are hugely important. The dollar is softening and the renminbi is rallying. Trade. This remains the most unpredictable element, given the ongoing negotiations between Washington and Beijing. If no deal is reached by the 2 March deadline and US President Donald Trump slaps 25% tariffs on all $500bn+ of China’s exports to the US that will hurt China (and quite possible America, too, not that the White House sees it that way). But Beijing is looking to support its economy, via tax cuts for consumers and lower pension contributions for corporations. These changes are more subtle than 2016’s debt-funded spending spree on fixed assets and property. They may bring longer-term benefits in the form of rising consumption and more productive investment, even if those benefits are less immediate. Debt and growth remain huge long-term issues and the trade talks remain a key near-term catalyst. But at least Chinese stocks are discounting a negative outcome so any trade deal with the US could be the first step on the road to recovery for the downtrodden Shanghai stock market and firms who sell into China.